Planning a cultural crash course in Brooklyn's Russian south can be a daunting task, one that calls for a well-seasoned stomach to get through a spectrum of cuisine throughout the day. Russian-born Fathom intern Boris Ebzeev and his friend Kat chisel out the best route to take. BROOKLYN – Growing up nearby in southern Brooklyn, I've had a turbulent relationship with the Russian enclave of Brighton Beach. I've leapt from childhood indifference to disgust to awe and back to disgust before finally settling into a nostalgic appreciation for the lively locale. As a kid, the trauma of nameless fluids dripping onto my slice of pizza from the screeching Q train above was simply too strong to allow me to see the neighborhood for the gem it really is. With the highest concentration of Russian speakers outside of the former Soviet republics, Brighton and its surrounding environs have a lot to offer for those unafraid of the language barrier. Little Odessa, one of the colloquial names for Brighton Beach, is hardly just an Odessa these days. It's an assortment of cultures spanning the old continent from Kiev to Karagandy. It's a cultural mecca as cosmopolitan and diverse as the Soviet Union was — just one two-millionth of its size. On your way to getting lost in the belly of little Russia, Sheepshead Bay is a good neighborhood to dip your toes in. We took the scenic B train to the aptly named Sheepshead Bay station, located a few blocks from the water. Newsstands and grocery stores line the main road here, and a younger generation of Russians are usually mingling in the area's many frozen yogurt joints and sushi restaurants. We skipped over to Arbuz (named for the Russian word for watermelon) and snagged a light yogurt parfait with free banter from the bouncy, cheerful cashiers. Later, we shook off the sweets before taking the short stroll west to Nargis Cafe, a pleasant eatery along Coney Island Avenue serving Uzbek and Central Asian fare. You can't miss the purple awning on this otherwise desolate street. Though the restaurant enjoys a sizable following among the locals, you'll rarely see outsiders pass through the doors. So don't be shocked to hear the hostess greet you in Russian. This is your chance to practice. Nargis Cafe's lavish appearance is humbled by the contrasting old world décor. Bell-curved hallway arches and walls are reminiscent of mosques in Kyrgyzstan and Uzbekistan — all predominantly Muslim, Russian-speaking countries that also lend this place their cuisine. Laghman stew, a basket full of manty, and a big round lepeshka. Our waitress Fariza recommended laghman stew: a spicy kimchee-like broth pooled in a spiral of chewy noodles, lamb, and carrots. The Korean influence in the dish is apparent, as a large population of ethnic Koreans has been living in Central Asia since the 1930s. We finished up lunch with a plate of steamed Caucasus style manti dumplings, which are filled with meat and served with a side of cold sour cream. The hearty meal was washed down with a rose-tinted glass of kompot, made from various boiled fruits. 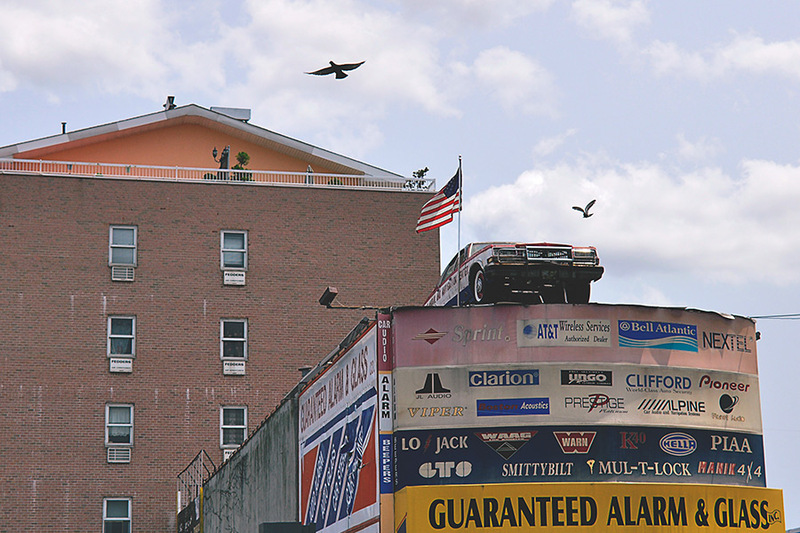 Coney Island Ave's motorized guardian angel has been presiding since before I was born. For dessert, we jammed in pretend earplugs and followed our nose beneath the loud elevated rail, and onwards to the famous pierogi stand attached to Best Buy International Food. The animated old woman is accustomed to the publicity surrounding her stand. "More people from Moscow coming to review me for the Internet? This is so exciting!" she cheered as she posed for a photograph. 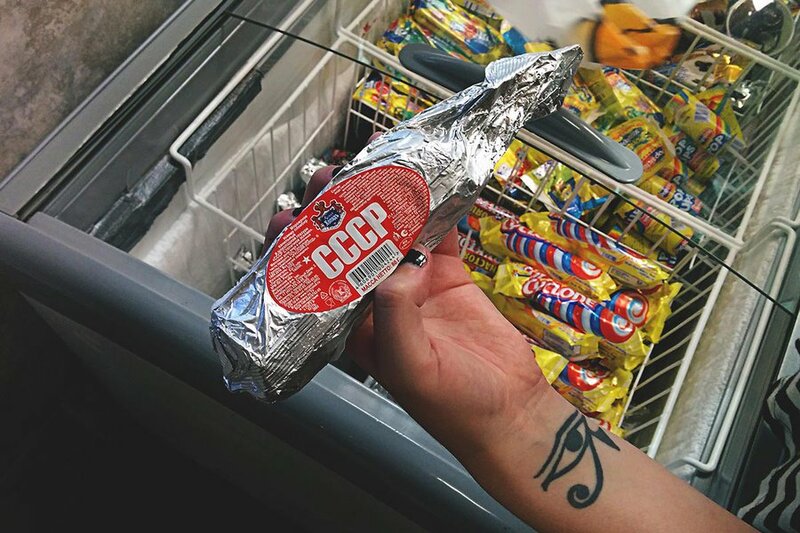 The goodies are all labeled in Russian, but just ask about them. She knows enough English to describe each pastry to you. I got a makavi pierog, the sweet poppyseed cake I stuffed my face with as a kid. If you still have room in your stomach for something savory, I recommend khachapuri. The salty Georgian cheese pie is so ubiquitous in its home country that there's a khachapuri index, humorously used to measure inflation based on the average cost of its ingredients. A typical Brighton scene beneath the loud hairpin turn of the B/Q subway. At Best Buy International Food, you'll find all the staples of the Russian kitchen: sauerkraut, sunflower seeds, a variety of cured meats, and a gallery of candies from around the world. The ominously perfect baby girl illustrated on the packaging of an Alenka chocolate bar drew me in right away, so I bought a few to bring home. Though my quest for a bottle of kumis (a fermented mare's milk beverage enjoyed in Mongolia and Siberia) proved to be futile, I settled for the more familiar dairy alternative of kefir and powered on. Older Russians would sometimes tell me, "Exercise is great and all, but why work up a sweat running about when you can sit still at the sauna to reach the same outcome?" Who are we to dispute these words of wisdom? 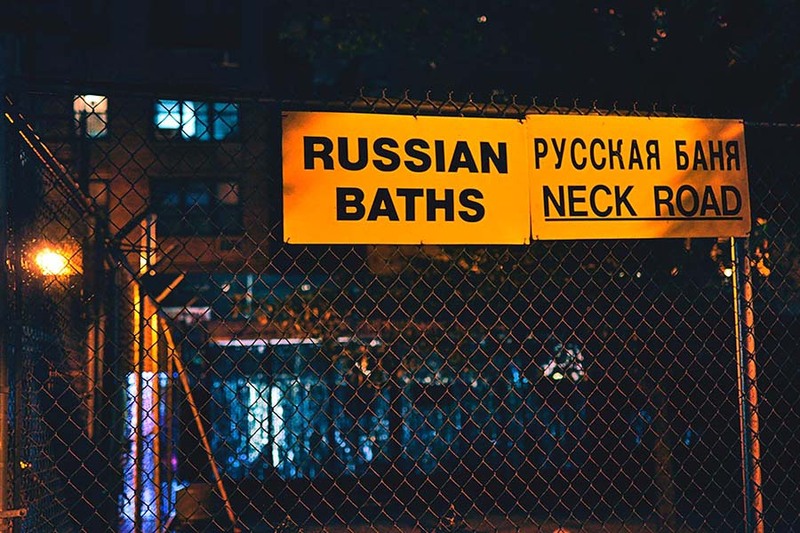 We took the Q train a few stops up to Neck Road and came to the nondescript gate of Russian Bath on Neck Road. We've been walking all day; it was time to heal up our aching bodies. Clueless, we tiptoed through the pool area, countless friendly regulars happy to show us the way. Don't let the unremarkable entrance fool you. We sat in the steam-filled banya (a heated wooden room) for a few minutes and watched as bathers gently whacked their skin with an aromatic venik, a tied bundle of birch leaves used to keep the hot air circulating. After making a few rounds to the pool and back to the banya, we laid down in the courtyard lounge to decompress with a fresh-squeezed orange juice made on the premises. The night wasn't over yet. Hastily, we marched across the Sheepshead footbridge back to Brighton, heckled the whole way by a group of fat swans that live in the adjacent marina. Our journey's end was Boardwalk Billiards, back on the now-quiet intersection where we had stocked up on pierogis mere hours earlier. 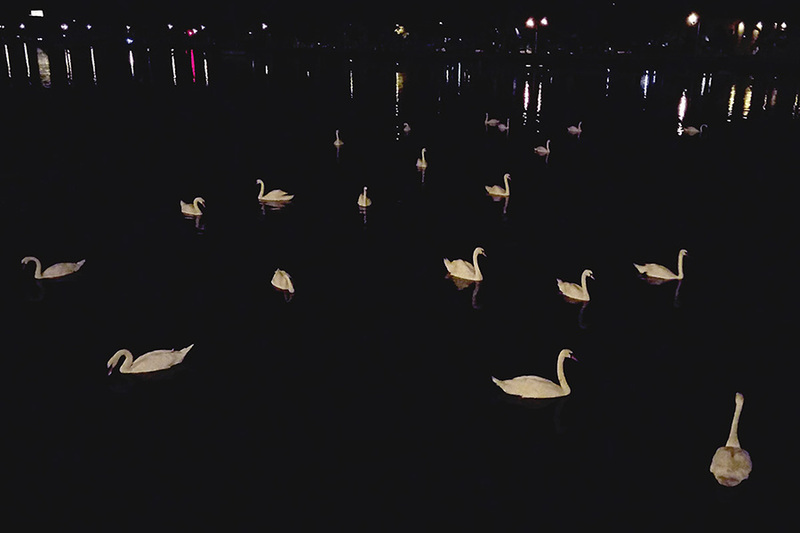 The flocks of swans practically materialize beneath you when food is mentioned. Open past midnight and only $6 per person, this place is a lovely bargain. 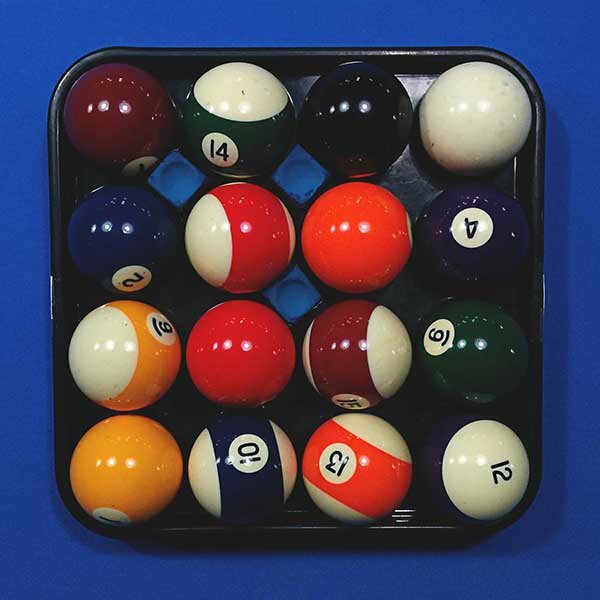 The years spent unlearning pool skills were visible in the scuffmarks I left on the newly refelted billiard table. We felt like feathers in the breeze after that trip to the sauna, so we took our sweet time playing beneath the muted yellow lamps as we swayed to Shakira's "Hips Don't Lie." Coming up with your own rules of the game is just part of the fun. A pile of sauerkraut, or kislaya kopusta, at the Brighton Bazaar. The most logical explanation for little piles of black shells at the neighborhood hangout spots. Fully stocked meat fridge at Best Buy International Food, Brighton. Goodies sold straight from the street outside Best Buy International Food, Brighton. Bagging goods beneath the B/Q subway. Brighton's not all Russian; Pakistani and Mexican immigrants also make up a large portion of the residents just north of Brighton Beach Ave.
Raspberry, cherry, apricot, and apple pierogi sit patiently behind the glass. Wall decor at Nargis Cafe. We snagged lunch at a peaceful time. Believe me, the place fills up for the afternoon. The tile wall is beautiful, but it's hard not to stare at the television while slurping your laghman. Kat in the reflection. We're looking forward to lunch here. 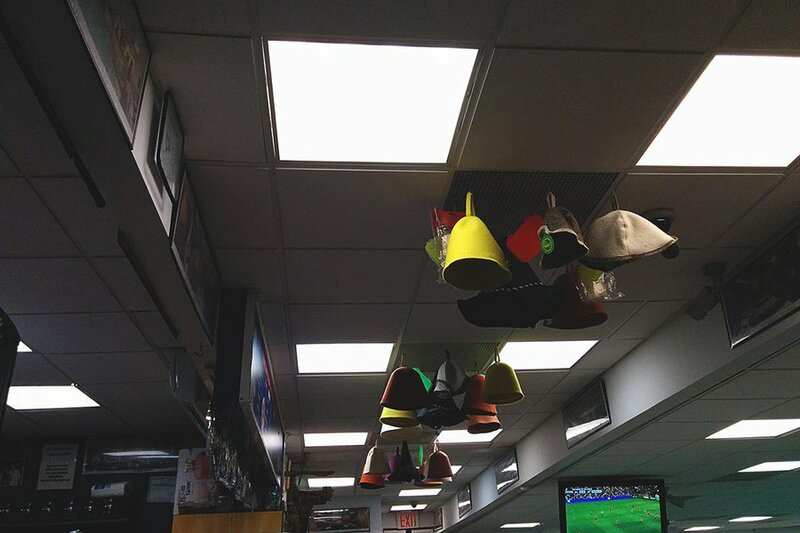 These silly felt hats are traditionally worn in the Russian sauna to keep your head cool. The number one hit among patrons of Russian Bath of Neck Road. 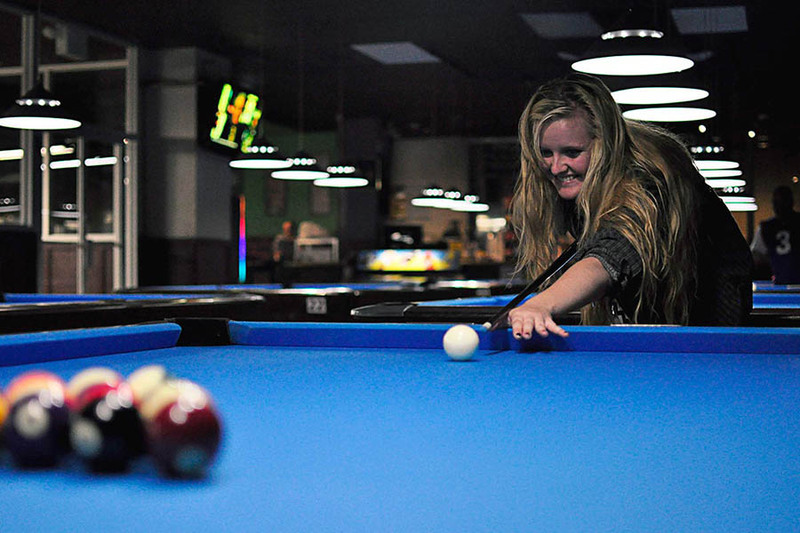 Learning how to play at Boardwalk Billiards. Posing babushka on Brighton Beach Ave.
See all the locations in this story. Boris is a photographer, and token native of New York City. He travels for the weird stories to tell back home.